Upgrade your brunch with one of the most crowd pleasing bakes we’ve ever made! In a large saucepan, bring the broth and the salt to a boil over high heat. Reduce the heat to low, then whisk in the grits and let it come back to a simmer. Cover and cook for 10 minutes, then whisk the grits again, making sure to scrape everything up from the bottom of the pan. Place the lid back on the pan and cook for 15 minutes more, then stir in the butter, pepper, and cheese, then taste and add add up to ½ teaspoon more salt, if desired. 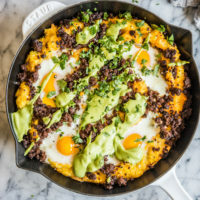 While the grits are cooking, add the chorizo to a skillet over medium heat and cook for 7-10 minutes, until crisp, then drain the chorizo of excess grease and set aside. Spread the grits into a 10-inch cast iron or 2.5 quart casserole dish, then make 4 wells in the grits. Crack the eggs into the wells and season with salt and pepper, then sprinkle the chorizo over top of the grits and eggs. Bake for 25-30 minutes, until the eggs are set. While the grits and eggs bake, blend the avocado, cilantro, salt, lime juice, and water until smooth. Pour the avocado cilantro sauce over the grit and egg bake and serve! **To make the recipe dairy-free substitute ghee for butter.